Can a Felon Buy Ammo? There are federal restrictions against felons owning a firearm. This is one of the many things felons are not allowed after they leave prison. While some of their crimes may have involved a weapon, this ban is in place regardless of the nature of their crime. While it is illegal for them to possess a firearm, can a felon buy ammo? 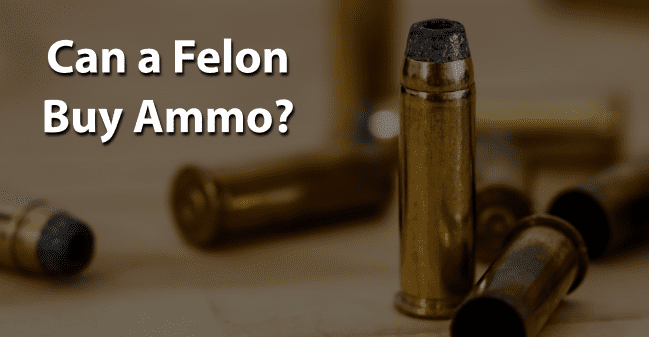 This blog post will address the question of whether or not a felon can buy ammo. After their release from prison, many felons enjoy taking up past-times that they once engaged in. For many this may be hunting. In 1934, the federal government passed a law denying anyone convicted of a violent felony the right to own a gun. This added to a restriction that already existed to prevent violent felons from owning machine guns. The law remained until the Gun Control Act in 1968 when it was amended to include all persons convicted of any felony, even those that did not involve violence. This remains in effect until the current day. Federally-prohibited purchaser categories for firearms also apply to ammunition. However, federal law does not require ammunition sellers to conduct background checks to determine if a person falls into a prohibited category. Being caught with just one bullet will result in being tried and convicted of another felony, which will likely carry a more severe sentence because of a prior conviction whether it was a violent crime or not. These charges would require retaining an attorney. Federal law also prohibits the manufacture, importation, sale, or delivery of armor-piercing ammunition. Armor-piercing ammunition, sometimes referred to as metal-piercing ammunition, is ammunition that is designed primarily to penetrate metal or armor, including body armor commonly worn by police officers. Six states have passed laws regulating ammunition sales and requiring purchasers to pass a background check in order to buy ammunition. These are California, New York, Connecticut, Illinois, Massachusetts, and New Jersey. Additional states restrict access to ammunition by certain categories of dangerous people or people under a certain age. While federal laws typically refer to ammunition for a firearm, there are other weapons that are often used for hunting and come into question for felons. A gun manufactured before 1898 is considered to be an antique gun. Federal law does not prohibit felons from owning an antique firearm. Any muzzle-loading rifle, shotgun, or pistol made to use black powder or a black powder substitute and which cannot use fixed ammunition is considered to be an antique firearm. Felons are allowed to possess this type of ammunition as long as they have less than 50 pounds of black powder, and it is intended for sporting, recreational, or cultural purposes. There are muzzle-loading guns that are not considered to be an antique because it uses the frame or receiver of a firearm. Since federal law allows felons to own so-called antique firearms, state or local law may still classify such weapons as firearms which are banned for felons. It would be important to check with the specific State Attorney General’s Office before acquiring a muzzle-loading gun. A pellet gun is a type of pneumatic weapon which uses compressed air or CO2 to propel a projectile. Firearms use a propellant charge to shoot. The speed of the projectile is much slower with a pellet gun than a traditional firearm. A pellet is a non-spherical projectile designed to be fired from a pellet gun. A felon is allowed to buy pellets for that weapon. In order to once again buy ammunition for a firearm, a felon must regain the right to own a firearm. Basically, this process requires a felon to have his or her record expunged. Once this is accomplished, not only can a felon own a firearm but he or she can purchase the ammunition needed for that firearm. A felon can enjoy hunting with a firearm again and be allowed to legally buy ammunition for it. A felon doesn’t have to be defined by his or her crime. We aren’t defined by our mistakes but by how we respond to them. So what do you think about this blog post about a felon can buy ammo? Have you or someone you know been in this situation? What was that like and were they successful? Please tell us in the comments below.